Flight from Death is the first film to investigate the psychological effects of death anxiety, or fear of death. This 90-minute documentary about the effects that our reactions to death anxiety have on a psychological, spiritual, and cultural level reveals convincingly that death denial is a root cause of human behavior and more importantly, violence and aggression. The effects of death anxiety are embedded within everything we do across the globe. Our architecture, our careers, the children we raise, and the wars we wage, are all manifestations of our desire to gain a sense of permanence in defiance of our mortality. This film is a cinematic approach to these theories, placing them in a modern context and portraying them in ways that are both stimulating as well as reflective of the importance and magnitude of their implications. Flight from Death is the culmination of many years of research and shooting all over the world in locations such as Egypt, Israel, Guyana, Greece, and China. It features interviews with leading scholars, philosophers, researchers and authors such as Robert Jay Lifton, Irvin Yalom, and Sam Keen culminating in the most comprehensive, multidisciplinary, and mind-blowing investigation of humankind’s relationship with death ever captured on film. 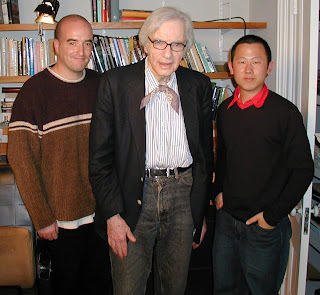 FFD crew with psychohistorian Robert Jay Lifton.